Better Safety. Easy To Use. Kleard quickly verifies a buyer's contact info and links them to their mobile device, which is trackable. This is a deterrent to anyone thinking of committing a crime. Agents can feel confident knowing that there's a safety layer in place when showing homes or hosting an open house. Sellers often have valuables in their home and they want to make sure their belongings stay safe. Because Kleard has crime prevention mechanisms in place, sellers can feel more at ease knowing visitors' information is stored, just in case a problem ever were to occur. 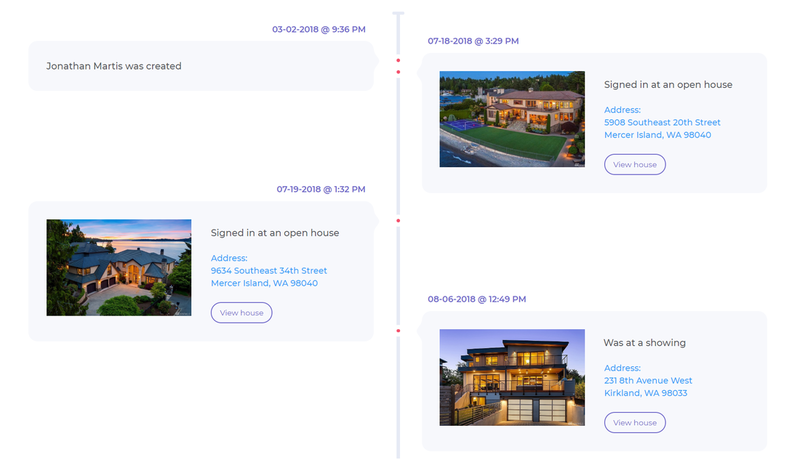 Kleard logs when visitors sign into open houses and when agents start/end showings. The brokerage can see these details along with which buyer is with the agent, this is key. Just another way Kleard is helping to create a safer real estate environment. Don't Show Homes Blind. Verify with Kleard. Showings homes are at times avoided by many agents because of the safety worries. With Kleard, you can verify buyers on-the-spot and assign them to a showing. A potential criminal is much less likely to commit a crime if they know they're being verified AND being linked to your showing. Real Leads + CRM. Simplified. In real time, Kleard quickly verifies a buyer's contact info that attends an open house. Agents are notified on their mobile device with the buyer's details within seconds. What's the point of having a sign in sheet if the info isn't valid? Kleard's CRM makes it easy to follow-up and organize your verified leads. Use our built-in mail merge system which allows you to quickly send personalized emails and text messages. You can even include email attachments too. Keeping track of when you spoke to a lead and what you discussed is important. Kleard's intuitive note taking feature helps make this a breeze, and with timestamps built right in, you'll be able to know when those notes were added. Open houses can be just as dangerous as showings and with Kleard, you can verify all visitors who come through. We've struck a perfect balance of safety measures and nearly instant dual-verification for an easier and fluid process. Homeowners will love that their agent is using Kleard. On top of that, the leads that come through are more likely to work with you compared to online leads. Think of this feature of Kleard as an open house app or an open house sign in sheet that makes your job safer and easier. When you're finished hosting your open house with Kleard, you can quickly create a seller report with all the sign-in info included. ​It looks clean, professional, and your sellers will appreciate you keeping them in the loop on how everything went. When you verify someone with Kleard, you're adding a safety layer with the individual's info which is instantly synced with your brokerage's account. This includes the location, time of verification, and reminders to end the showing. We've built in countless safety measures to make sure you can be confident on the job. Because the phone number and email info is verified, you can feel confident the information is solid, without worrying about getting bounced emails or disconnected phone numbers. Also, because you're meeting these people in-person, the quality of the leads are much higher than what you'd get from online leads. Signage works; It's that simple. We at Kleard know this, which is why we have powerful signage for those times you're hosting your open house. Our signage has been proven to work and when open house visitors come to the home, they already know what to expect which eliminates the need for you as the agent to explain. Kleard Follow-Up is Blazingly Fast! Who wants to spend hours following up with leads? With Kleard, you can follow-up with your leads in seconds and is actually 26X faster than manual entry. The power you have at your fingertips is something to behold, and we're sure you'll never look at follow-up the same again. Buyers will appreciate the increased opportunities to visit open houses throughout the week instead of just on weekends. The number of nonfatal assaults on real estate professionals ballooned from 170 in 2008 to more than 900 in 2010. 70% of those attacks were on women. 75-85% of all victims were 40+ years old. More than 50% happened with a gun. Higher producing agents will not only generate significant revenue for themselves. It’s a win-win! Kleard helps agents obtain verified leads and can stay in touch using our awesome CRM. Consumers are expecting more sophistication from service providers who leverage technology, so those service providers better be ready to deliver. Your brokerage needs to be ahead of the game when it comes to technology and Kleard is how you can accomplish just that by giving your agents the tools they need to succeed and stay safe. Real estate advertising websites can charge thousands of dollars per month for lead generation and when you do get leads, they're usually low quality. Also, because the lead likely has never met the agent in person, there's little trust there which hurts the potential for that relationship to ever develop. Kleard's verified leads are generated from buyers who visit open houses. These leads are very high quality because buyers who attend open houses are usually ready to purchase in the near future. Because the agents are meeting the buyers in person, it means the agent can make a lasting impression that no online advertising company can replicate. ​All visitors must answer questions related to their home search such as if they're working with an agent, if they're pre-approved, and when they plan to purchase. Ask any successful real estate agent and they'll tell you, open houses are a proven way to increase the number of closed transactions. ​of buyers that sign in is 97%. ​If asked, buyers are fine and willing to sign in. Some may be curious if buyers are willing to sign in at open houses. The key is to make sure proper signage is placed outside before the visitors enter the home so that they know they will be required to sign in. By doing this, buyers can decide if they are willing to oblige or not (if not they have the option of not coming into the home). Agents are also asked to sign in when attending Kleard open houses for that extra layer of safety.